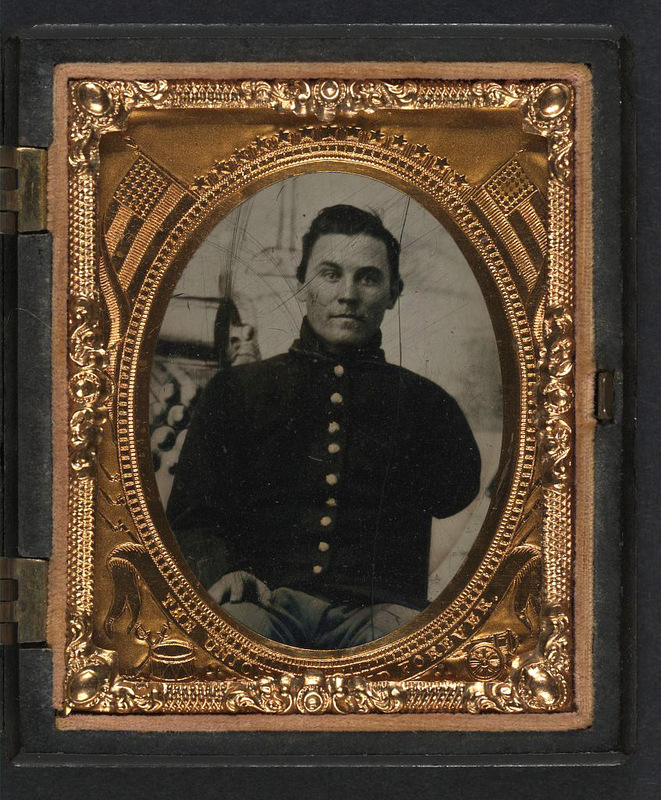 Originally published as "When Johnny Couldn't Come Marching Home: Civil War Amputations"
Many wounded soldiers during the Civil War (1861–1865), including those from North Carolina, had an operation called an amputation. In an amputation, a person has an arm or leg (or sometimes just a hand or foot) removed from their body because of a terrible injury or infection. Military advances before and during the Civil War meant more powerful, destructive weapons, and more devastating injuries, including shattered bones. Most American doctors, however, were unprepared to treat such terrible wounds. Their experience mostly included pulling teeth and lancing boils. They did not recognize the need for cleanliness and sanitation. Little was known about bacteria and germs. For example, bandages were used over and over, and on different people, without being cleaned. With so many patients, doctors did not have time to do tedious surgical repairs, and many wounds that could be treated easily today became very infected. So the army medics amputated lots of arms and legs, or limbs. About three-fourths of the operations performed during the war were amputations. These amputations were done by cutting off the limb quickly—in a circular-cut sawing motion—to keep the patient from dying of shock and pain. Remarkably, the resulting blood loss rarely caused death. Surgeons often left amputations to heal by granulation. This is a natural process by which new capillaries and thick tissue form—much like a scab—to protect the wound. When they had more time, surgeons might use the "fish-mouth" method. They would cut skin flaps (which looked like a fish’s mouth) and sew them to form a rounded stump. For soldiers who survived amputation and infection, it was natural to want an artificial, or fake, limb—both for looks and for function. An artificial arm will not provide a firm handshake, and an artificial leg will not get rid of a limp. But a prosthetic (another word used for an artificial limb) helps an amputee be less noticeable in public and offers the chance of a more regular daily life. Artificial limbs, especially legs, helped Civil War amputees get back to work to support themselves and their families. Agriculture had declined with so many soldiers away from home. After the war ended, it was important for men to return to their farms and increase production of food and money-making crops. Amputees were no different—they needed to be able to work on their farms, too. North Carolina responded quickly to the needs of its citizens. It became the first of the former Confederate states to offer artificial limbs to amputees. The General Assembly passed a resolution in February 1866 to provide artificial legs, or an equivalent sum of money (seventy dollars) to amputees who could not use them. Because artificial arms were not considered very functional, the state did not offer them, or equivalent money (fifty dollars), until 1867. While North Carolina operated its artificial limbs program, 1,550 Confederate veterans contacted the government for help. One Tar Heel veteran, Robert Alexander Hanna, had enlisted in the Confederate army on July 1, 1861. Two years later at Gettysburg, Pennsylvania, Hanna suffered wounds in the head and the left leg, just above the ankle joint. He suffered for about a month, with the wound oozing pus, before an amputation was done. After the war, Hanna received a wooden Jewett’s Patent Leg from the state in January 1867. According to family members, he saved that leg for special occasions, having made other artificial limbs to help him do his farmwork. (One homemade leg had a bull’s hoof for a foot!) The special care helped the Jewett’s Patent Leg last. When Hanna died in 1917 at about eighty-five years old, he had had the artificial leg for fifty years. It is a remarkable artifact—the only state-issued artificial leg on display today in North Carolina. Hanna’s wooden leg, as well as Civil War surgical equipment, may be seen at Bentonville Battlefield State Historic Site in Four Oaks. *Ansley Herring Wegner is a research historian with the North Carolina Office of Archives and History. She is the author of Phantom Pain: North Carolina’s Artificial-Limbs Program for Confederate Veterans. Wegner, Ansley Herring. 2004. Phantom Pain: North Carolina's Artificial-Limbs Program for Confederate Veterans. NC Office of Archives and History. U.S. National Library of Medicine. "Maimed Men." https://www.nlm.nih.gov/exhibition/lifeandlimb/maimedmen.html (accessed April 5, 2016). Amputation Kit. 1800-1899. From the Country Doctor Museum. Image courtesy of the Eastern North Carolina Digital Library, J.Y. Joyner Library, East Carolina University. https://digital.lib.ecu.edu/13941 (accessed May 4, 2015). Artificial foot that enables Limp-free walking. Patent number 16360. Issued January 1857 to Benjamin W. Jewett by the U.S. Patent Office. While doing family history, I found a confederate military record that describes a "maimed soldier" whose "seat of operation" was described as "l. 3 r. leg." Could this have been an amputation or another kind of surgery? Where can I find the meaning of this abbreviation? Thank you for visiting NCpedia and for taking the time to share your research and question. That is a great question! Unfortunately, I do not have a ready answer for you after a bit of digging and we don’t really have more information in NCpedia. But I have a couple of ideas. First, you may want to look at an historical volume called the American Illustrated Medical Dictionary. Here is the link to the digitized version of the 1906 edition -- https://hdl.handle.net/2027/uc1.a0004530911. I haven’t found the earlier versions available online, but this one may be useful. There is also an archival collection at Duke University -- the History of Medicine Collections -- https://library.duke.edu/rubenstein/history-of-medicine. Librarians and archivists at the library there may be able to help with additional information about medical and surgical terms and annotations used during the time period. They also have a nice research guide here: https://guides.library.duke.edu/c.php?g=289566&p=1930319. A book on the topic of Civil War amputations was published in 2015 – Empty Sleeves: amputation in the Civil War South. That may be useful along with others related to 19th century medicine and surgery. You may find WorldCat useful for searching for books. https://www.worldcat.org/. WorldCat is an online catalog that searches the holdings libraries and collections around the world. It’s very helpful. I hope this helps as a starter. Please let me know if you have additional questions. Thank you, Kelly, for taking the time to give me such a detailed reply. I am not completely sure, but I have decided that the meaning of a seat of operation at "L. 3 r. leg" during the Civil War, means an amputation of the lower third right leg. This especially seems likely to me since he (Samuel H. Dean, Co. F, GA 6th Cavalry) is described as a beneficiary of charity (Association for the Relief of Maimed Soldiers, Richmond, VA). Thanks again, Kelly, for your assistance. The American Illustrated Medical Dictionary published in 1906 (https://babel.hathitrust.org/cgi/pt?id=uc1.a0004530911;view=1up;seq=52) on pages 46 and 47 refers to amputations and thirds, i.e. amputation of lower third of forearm, of thigh in middle third, at lower third of thigh. The 1816 medical book (https://archive.org/details/2546082RX1.nlm.nih.gov) on page 429 has a reference to a person "being struck with a ball in the lower third of the leg at the battle of Marengo," which seems to support the thought that surgeons often thought of limbs in terms of thirds. The Duke University Libraries medical search engine (https://library.duke.edu/rubenstein/history-of-medicine) brought up no less than 6 journal articles, with titles like, "Comparison between Peroneus Brevis Flap and Reverse Sural Artery Flap for Coverage of Lower One-Third Leg Defects," again reinforcing this line of thinking, of locations on the leg being identified by thirds. Thanks again, Kelly, for your assistance. When people got amputated and got a prosthetic did they stop fighting and go back to their homes or did the continue fighting? I really enjoyed your article. I purchased the book and found one of my ancestors in the registry. Do you know if I may find a picture of him? In your research did you come across pictures? Why didn't the patients die from blood loss? You didn't really elaborate on that..
Amputation kits included a belt type toirniquet which compressed the artery. After severing the limb, a hook called a tenaculum was used to pull the arteries from the stump and they were tied off with sutures, usually silk or catgut, and released back into the stump. Nerves were also pulled out to be cut off so when released they would not be at the stump end and cause permanent pain. Great article! Were amputations performed on the actual battlefield or always later in the hospital tent? Also was morphine given before the amputation? If so was it administered via needle? I have read that half a million people left the war addicted. Morphine wasn't invent at the time of this war, but alternate anesthesia was used such as chloroform and opium. Since opium was a narcotic, veterans became addicted to it, and was nicknamed "veteran's disease". It was usually administrated by adding it to a cloth and putting the cloth to the patients mouth. Sorry to disagree but morphine was in common usage at the time. It is an opioid as is laudanum, heroin and paregoric. Chloroform and ether were used for putting the patient to sleep for the operation (anesthetics) but laudanum and morphine were used for the pain after. They were also often given to victims of wounds to the body cavity or head that were expected to die anyway, to relieve suffering until they died.